“Can we get Sanskrit names?”, the youngest student in my Kripalu yoga teacher training asked. The facilitators (former ashram residents who still went by their Sanskrit names) looked at one another, giggled, then shared that – actually – back in Kripalu’s ashram days, the way one got a Sanskrit name was pretty mundane: the swami’s assistant randomly flipped to a page in the Sanskrit name dictionary. None-the-less, eyes twinkling, they’d be willing to do the same for any of us who wanted. …as in Kali. Goddess of death, and destruction, she who exists “before light itself”. 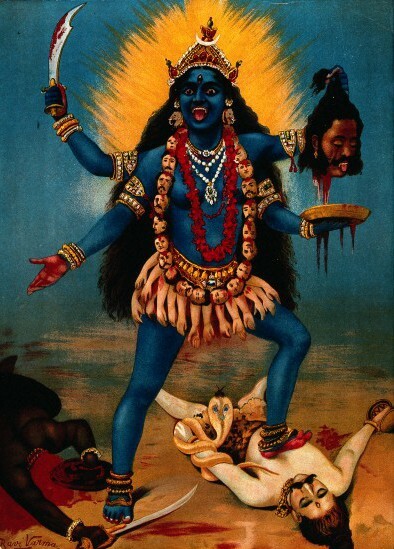 Kali is often portrayed wearing a necklace of skulls, wielding a sharp blade, and trampling upon a bloody corpse. Oh mama. That wouldn’t look right on my future yoga business card! My “Sanskrit name” became a cosmology lesson: asking me to reflect on my own culture’s fearful relationship with death. If everything is understood to be cyclical (a common underpinning in eastern, particularly Hindu, texts), including life itself (re-incarnation), then death and destruction lose the negative powers we attribute to them in the West (or at least some of them). Gone are the tomatoes and summer squash. Leaves drop and decay. Youngins start grades in school we foolishly couldn’t fathom before (innocence dropping much like the leaves). Did you know that the bright reds and yellows of trees in fall are always present in leaves? Even in spring! They are the visual spectrum manifested by compounds called anthocyanins and are simply hidden by the emerald shades of chlorophyll during chlorophyll-producing season. Once chlorophyll decays, other hues show through. Savasana translates as “corpse pose”, a mini-death at the end of one cycle of yoga sadhana, or practice. Savasana is our tribute to Kali. Savasana is an anthocyanin after you’ve polished off the chlorophyll of asana. Savasana is the autumn of the practice of yoga. [Tweet “Savasana is the autumn of yoga practice.”] Death, decay: thing is, these make the richest compost. From compost comes the most bountiful harvest. Each of us learns that lesson again and again in life, like it or not. Each of us knows goddess Kali in a personal way. Savasana befriends Her Fierceness, and brings us closer to the natural rhythms of our world. It varies the hues of our practice. Its “finality”, in my experience, aids us in delighting in all that comes before and after. Savor your savasana this season. Kali says time is short — Let’s stay in touch! Once or twice a month I send out a newsletter covering the best of yoga, optimal health, yoga anatomy, physical therapy and share the occasional recipe, PLUS amazing upcoming events, like my retreats and yoga anatomy trainings.